Welcome to Down On The Street, where we admire old vehicles found parked on the streets of the Island That Rust Forgot: Alameda, California. Yet another of The General's old soldiers keeps working in Alameda. 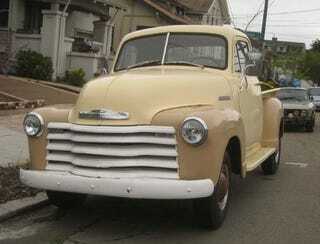 I'm unable to determine the exact year of this truck, what with all the parts swappage that takes place with work vehicles over the decades, but '52 is probably within a year. Some of you may have noticed the '73 Alfa GTV parked behind it; yes, the same person owns both the classic Alfa and the 68-year-old truck. How many of us can claim such great taste in vehicles? So many 50-plus-year-old GMC/Chevrolet pickups on the island; we've seen this '41 Chevy, this '45 Chevy, this '53 GMC, this '53 Chevy, and this '56 Chevy so far in this series.